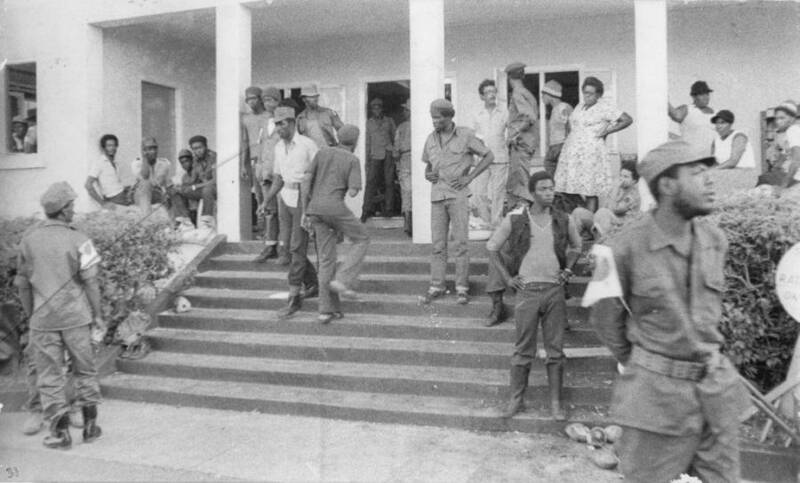 NJM supporters and NLA fighters gathered at Radio Free Grenada on the morning of 13 March 1979. Courtesy the Grenada National Museum. Two folks ah know. The morning of the REVO, ah was drinking rum, by Rush shop, waiting on me orders from Bro Dix. RD, first, I'll be picky and petty and say that I would have welcomed your post a few days ago, on March 13, 2019. But, here it is: a nostalgic photo of one moment of Grenadians' opportunity to forge meaningful change. Yet, it was squandered. A pox on those responsible (I guess) . . . It would have certainly been better timed day before yesterday. Woke up during the wee hours for a quencher and made the mistake of tuning into the news. The thought of people being slaughtered while kneeling to pray sickening. Enough of your fuckery. It happened in New Zealand. Genuine arse hole you can be Expat. [f word] you and your nonsense about legitimate gun owners. Who exactly is a legitimate gun owner?